Premier Hotels OÜ (hereinafter ‘we’) highly values the privacy of every client (hereinafter ‘you’). In this privacy notice, we will describe the kind of information we collect about you, why we do so and what we do with the data. Hotel Sophia was established with the aim to combine great hotel experience with good prices. The aim is to provide visitors with more than simply accommodation, be it a holiday, business or conference trip. 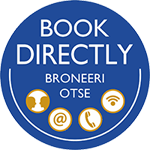 The hotel’s location is an effective hub between Estonian cities and easily accessible for visitors arriving by car, offering free-of-charge parking facilities. Restaurant Fii offers all its visitors delicious dishes, combining visual attractiveness and exciting flavours. In general, we obtain this information directly from you when you make a reservation or query through our website at www.sophia.tartuhotels.ee by phone or e-mail or when you purchase our services in person at our facilities. We use your information to provide accommodation and the other services you have purchased, as well as to meet obligations arising from regulatory legal acts and to pursue our general business objectives. 2.2. Domains belonging to Premier Hotels OÜ may, among other things, include an element that saves cookies for third parties.